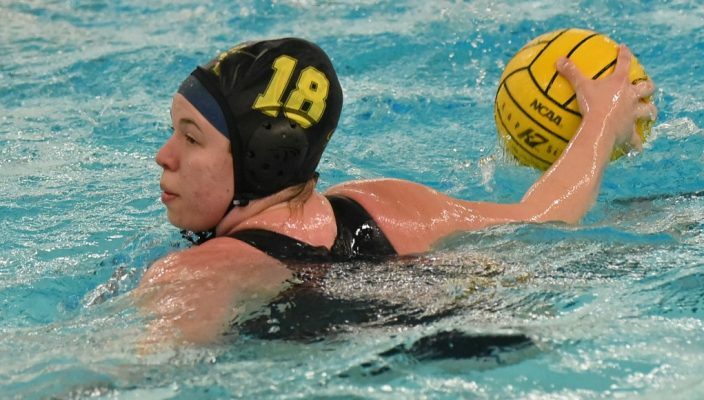 The Gannon University women’s water polo team went 2-1 over the weekend at the Penn State Behrend Tournament, beating Behrend’s club team, 15-10, and McKendree, 14-9, while falling to Villanova, 11-10, on Senior Night. The Knights started their busy weekend Saturday by beating Penn State’s club team at Behrend’s Junker Center. Gannon got off to a quick start, leading 5-3 after the first quarter and carrying an 8-5 lead into half. Momentum continued into the second with Campbell Ruh tallying a three-goal third quarter on the way to a four-goal game. Maggie Fortin and Nicole Wiemken had three goals each in the win as well. The Knights had a quick turnaround, playing their only home game of the season later Saturday when they dropped an 11-10 Senior Night decision to Villanova at Carneval Athletic Pavilion. Gannon got off to another hot start, leading 4-2 after the first and holding on 6-5 at half. ‘Nova pushed back late in the game keeping it close to the fourth. Kate Murray broke the tie for the Wildcats when she put her team up with 5 minutes, 33 seconds remaining. Kate Stenmoen added another goal shortly after to secure the win for Villanova. Murray and Stenmoen each had three goals, and Murray led all players with four assists. The Knights’ only senior, goalie Isabelle Vieira, held ‘Nova to 11 goals and saved the other 14 shots she faced. Katy Fehr had a game-high six goals for Gannon and was helped on offense by Julia Kredinger and Ruh, who scored two and three goals, respectively. In the final game of the weekend the Knights beat McKendree Sunday back at the Junker Center Pool. McKendree kept the game close until Gannon pulled away in the second quarter by scoring three unanswered goals. Fehr lead the Knights in scoring, putting up five goals and an assist. Wiemken tallied three of her own goals and Libby Tirak had two. Vieira allowed nine goals and saved seven in the game. After this week of action Gannon’s overall record improves to 6-14. The Knights’ next match isn’t until Saturday, April 13, when they play rival Mercyhurst at the Cathedral Prep Events Center. The Lakers have won four in a row, routing Grove City, 23-11, and picking up two wins in the Behrend Invitational against the Penn State club team and Behrend team. Mercyhurst also beat Villanova, 14-9, Sunday morning.